One common misconception I hear about all the time is the confusion surrounding the phrase “Passport Office”. There is more than type of “passport office”, in fact passport offices can be grouped into two general categories and I will be explaining the differences between them. There are more than 8000 locally located government offices throughout the country that are what is commonly known as an acceptance agent. An acceptance agent is basically someone that the Department of State trusts and has authorized (typically postal workers, courthouse workers, etc..) to witness an applicant’s signature on a passport application form. Acceptance agents basically do a pre-check on your application and supporting documentation so that any errors or omissions can be dealt with before the application is submitted. While this does cut down on the number of applications that are suspended because of incomplete forms, errors, or other problems there are times when acceptance agents will miss something and an applicant’s passport application will become suspended anyway. Please keep in mind that acceptance agents do NOT issue passports; they simply send the documents to the regional facility. The standard passport issuance time for a passport through an acceptance agent is 4-8 weeks; an expedited service is also available if you need your passport in 2-3 weeks. Anything faster than that will require you either going to a regional passport agency office or hiring a passport expediter to go on your behalf. If you go this route and if you had to go to have your documents witnessed and sealed, you will still need to go there, have your documents sealed and returned to you so you can send them to a passport expediting service. 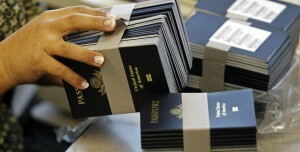 There are 26 regional passport agency offices and 1 Special Issuance office located around the country. All of these regional offices require that an advance appointment be scheduled. All of these passport agency offices issue passports, most of the time your passport will be available the same day that you go there. You will need to provide the same identification proof and documentation when visiting one of these offices in-person as you do when sending away for your passport or going to an acceptance agent office and having them send your passport application to a regional processing facility. Appointments at the regional passport office can be booked up to several weeks in advance; you will also need to provide proof of upcoming travel – without your airline tickets or itinerary, your passport issuance could possibly be delayed. If you are traveling soon it is possible that no appointments will be available at a regional facility near you. Facilities that support the largest cities like New York, Miami, Houston, Los Angles, San Francisco, Washington DC and other are often times fully booked for a couple of weeks in advance. In these situations we highly recommend that hire an expediting service to use one their daily submission appointments for your passport application, you can get your passport in as quick as 24 hours this way even if no appointments are available at your nearest regional facility.